Thanks. It’s always a work-in-progress. I have such a hard time setting time limits because I just want to keep working, but it really is a good idea so you don’t let one area consume your life. I’ve heard of people who set alarms and reminders, but I’ve never gone that route. Great tips for staying in check! Agree with you re: the power of no! It’s difficult to say (especially when we want to do it all!) but usually ends up helping more than hurting us. Do you try it? Any other tips to share so that we can say no without feeling guilty? Vacation time is such a valuable piece of advice. I’ve really struggled to stop working when I’ve taken vacations, and as a result, I come back, not as energized as I had hoped I would be. Thanks for sharing! Exactly! I’ve done the same in the past, too. It’s just not a vacation if you’re always plugged in! Saying no is really underrated. Whether it’s at work or a social obligation, sometimes it’s good to just know your limits. Yes! It can definitely be a challenge, but remembering how you feel when you’re stretched to the limits might make it easier for the “no” to come out. I agree. I don’t think there should be rewards for not taking a personal day. You can’t put your best work forward if you’re stressed or over-worked. Being able to say no, and feel comfortable with it, is a big part of taking control over your work/life balance… well said! It can definitely be a challenge! I really like to do things, but sometimes my work-life-social obligations are just too much. Saying no is the only option if I’d like to keep my sanity! I like the idea of setting time limits. I often get laser focused on one project or multiple projects at one time and don’t really get much done so that I can go relax. This would definitely help that. Great tips! Omg you’re a life saver! I’ve never thought of setting time limits…this will totally change how I organize my day. Thanks for the tips! I’m such a huge fan of the to-do list! It’s ice to be able to get everything out of your head and into a nice orderly format. 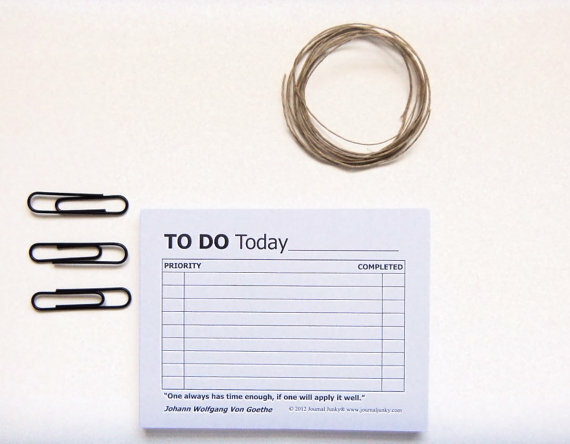 So many of us in the linkup are to do list junkies. I don’t know how people live without them! I also take on a lot – for me it’s definitely a Type A thing and wanting to be involved in everything. Also, love love love those little calling cards! Just perfect, I’d totally use them all the time. They are cute, I agree! Setting time limits is a great idea I haven’t tried! Will have to give it a go. 🙂 That’s why I like this topic so much – it’s about finding the techniques that work for you personally. I didn’t actually participate in the link up, but I loved the topic so much I’m posting about it today. There are so many good posts, and I haven’t even read through all of them yet! I love that you wrote on the topic post-linkup. Next month, join in!